Sorry gang, this is it. 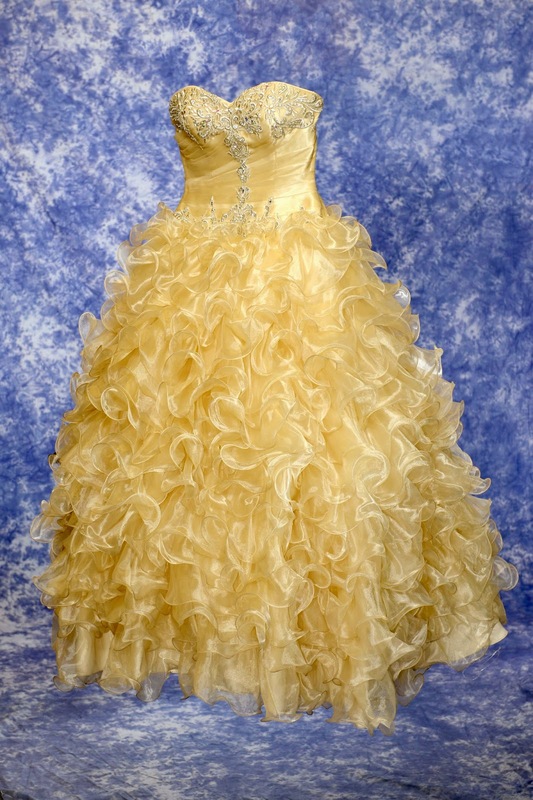 I'm writing this after spending nearly 4 hours to get this photo of Gretchen's Quinceanera dress for her album. This has been something of a matter of pride, since my first effort was a disaster. Now I'm not holding this image up for it's esthetic merit, but rather as an example that things aren't always as easy as you might think. This photo has a history. Three weeks ago I tried to make the photo, but while I was satisfied with the lighting, the original background and the visual concept didn't make it. My go-to blue background was more distracting than helpful, and even though I struggled mightily to get things done right, nobody liked the image. The main problem was my initial concept: I had created an image where the disembodied dress floated in front of the background, without any sense of context. It was actually rather spooky, since it looked like the Invisible Woman was wearing it, or should I say "floating" in it. Well, at least the colors looked pretty good. Here it is (Photo #1). There were some things I liked about this shot. The blue background was very forgiving about exposure, since one could light it up or down, depending on how the final produce was going to look. The mottled background makes it difficult to see any wrinkles in the background, so I wasn't obligated to drench the backdrop in light. The blue compliments the golden "campaign" color of the dress. I believe I used a gridded softbox for the shot, which helped to show the fine details in the dress. This "floating in space" look was a visual dead end. Some friends suggested that a hanger would add some context, so I bought some satin hangers just for the shot. I still didn't like the idea of the dress hanging from the loops, so I decided to hide them with flowers. I went to a local craft store and purchased a red rose garland, along with some light colored "stemmed" roses, and a single pink, long stem rose, just in case. 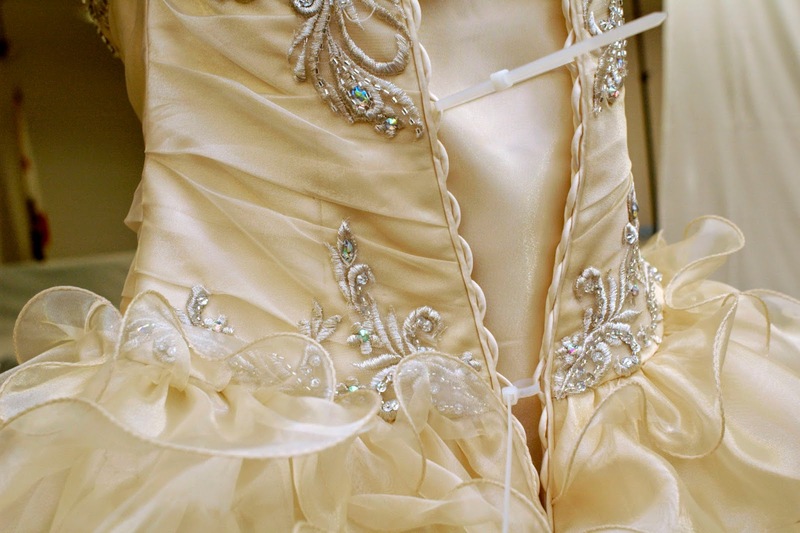 Prepping the dress was a major job. First, I had to close the gown from behind. Like a bridal gown, it laced from the back. As I would only be photographing the front, I used some cable ties to close up the back (Photo #2). Next, I found some cardboard and made a tube to slip inside the bodice to give it some shape. I realized that all of this preparation was actually turning the dress into a giant flower pot, which would allow me to hang the red rose garland more easily. 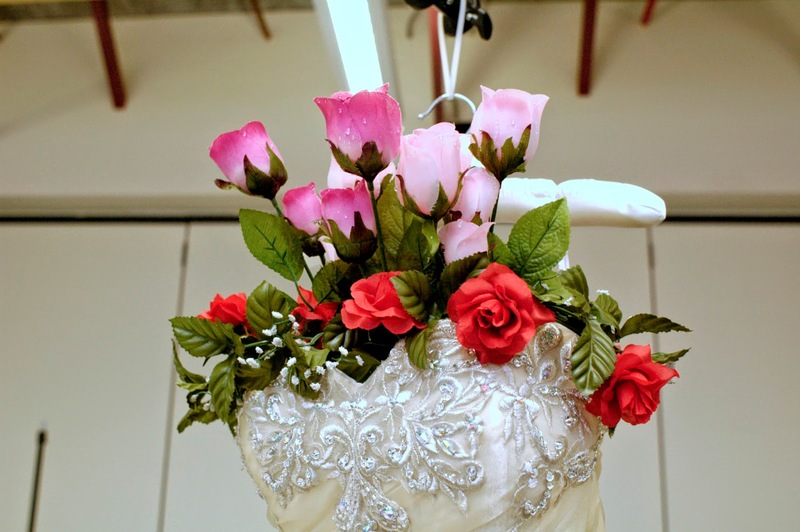 When I placed the garlands on the dress, it looked a little too "wedding", so rather than rely on the pink roses alone, I just let a few red roses peek over the edge, using the pink and violet "stems" to give the arrangement a little elevation. A flower arranger I'm not, so I pushed the flowers in as best I could. Here's the final arrangement. 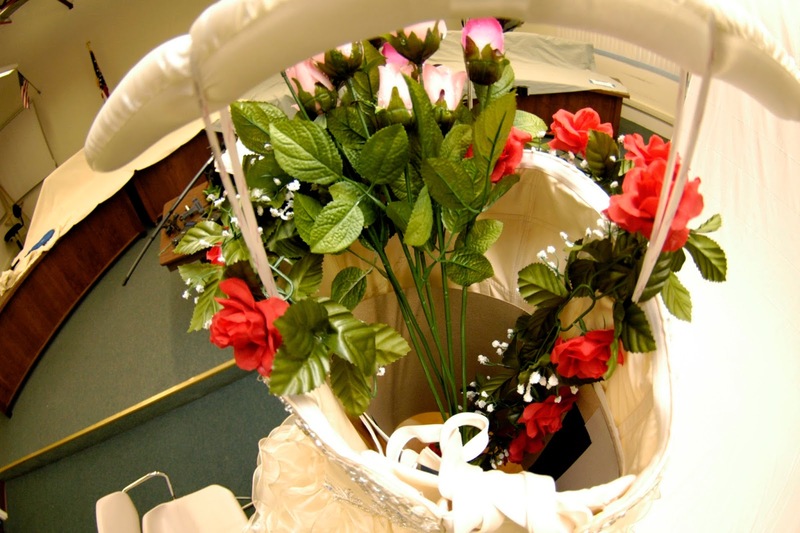 Because so few red roses are visible, the arrangement doesn't shout "wedding". Photo #3 was a quick available light shot made from ground level. The dress was actually hanging from a boom to keep the dress off the ground. More on that later. 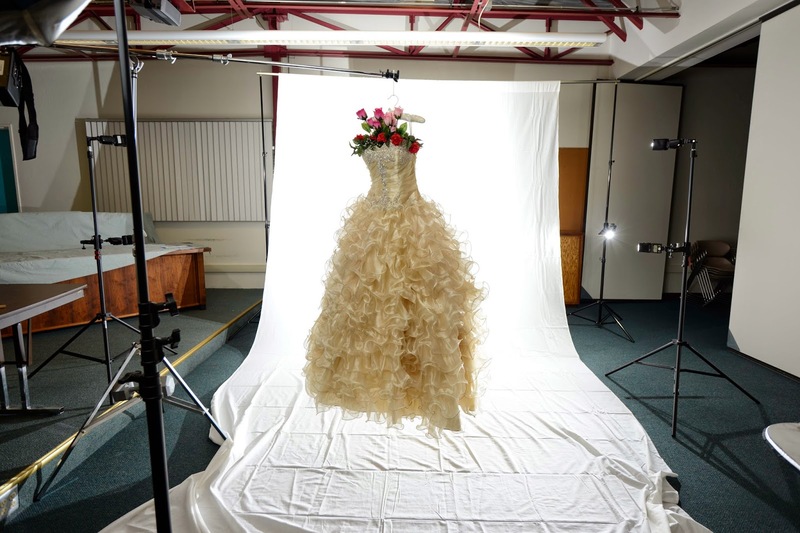 This shot was made with a fish eye lens with the camera almost inside the dress. If you look closely, you can see the cardboard tube that I used to give the dress its shape (Photo #4). I did tape the roses together to make them easier to handle and to keep them for falling through the cardboard tube onto the floor. 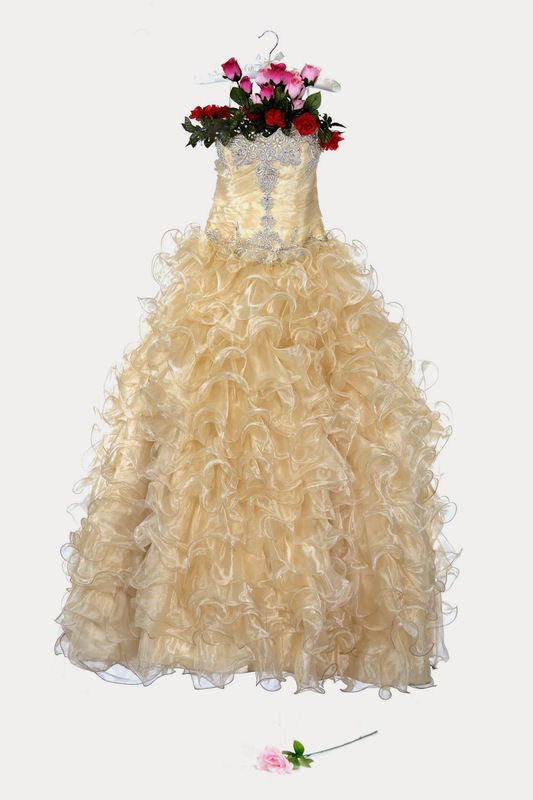 This gave me the idea for the single rose on the ground at the base of the dress. Whimsical, perhaps, but I could always clone it out if Gretchen doesn't like it. Big Problems: The biggest problem was the background (Photo #5). I purchased an inexpensive white muslin background, which I thought would be much easier to use that the traditional paper rolls I once relied on. 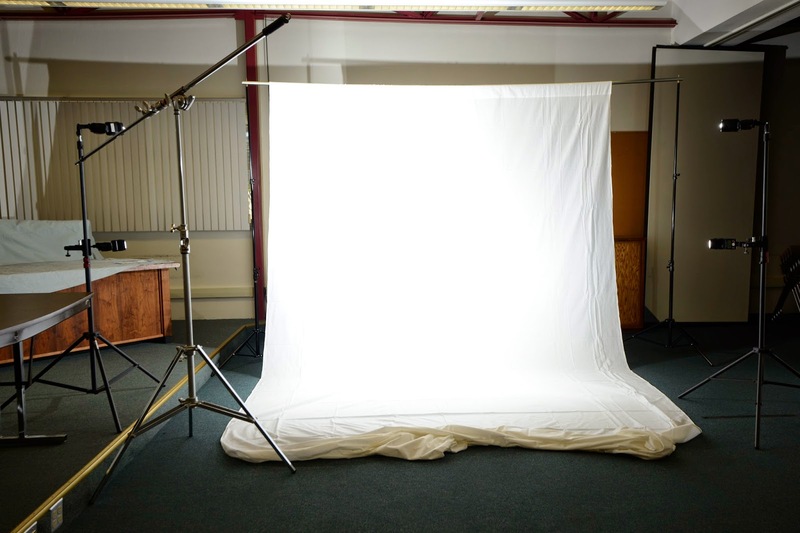 The biggest problem in the shoot was providing enough light to make the creases disappear. This was harder that I would have guessed, since the cross light arrangement I used (2 Nikon speedlights on each side) couldn't completely eliminate those darned creases. As a result, the power output was boosted to the point where it affected the overall contrast of the image. You can see that wrinkles are still visible in the upper right hand corner, so I adjusted my camera left lights to provide more light. In the end I got what I wanted, but the exposure pretty much blasted the exposure off the right side of the histogram. 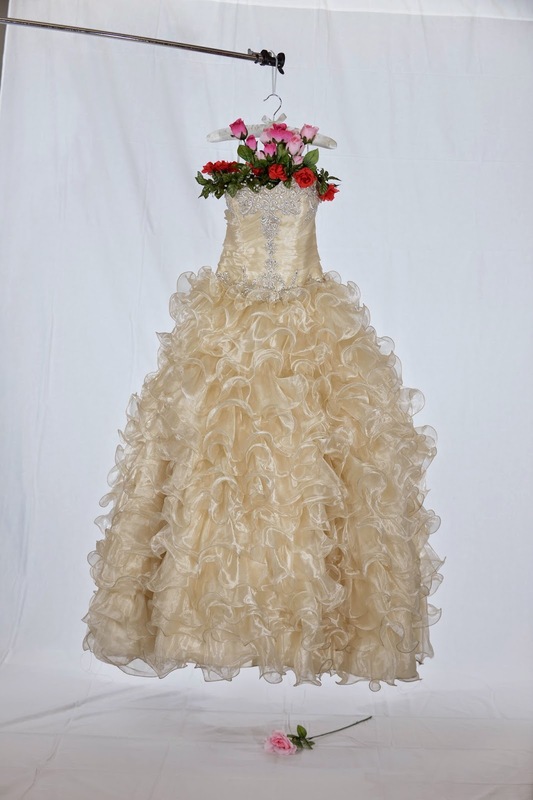 The overexposed white background allowed some light to pass through the dress, which hid some of the subtle detail. Hanging The Dress: The dress was hung from a boom arm of a very sturdy light stand, weighted at the base with a 25 pound dumbbell and counter-weighted with a Norman B200 battery pack (Photo #6). I knew I could easily clone out the boom. The wrinkles on the floor were another matter. There wasn't any way I could get enough light on the floor to completely eliminate them, so I know there would be some heavy retouching involved. The final shot is shown below (Photo #7). 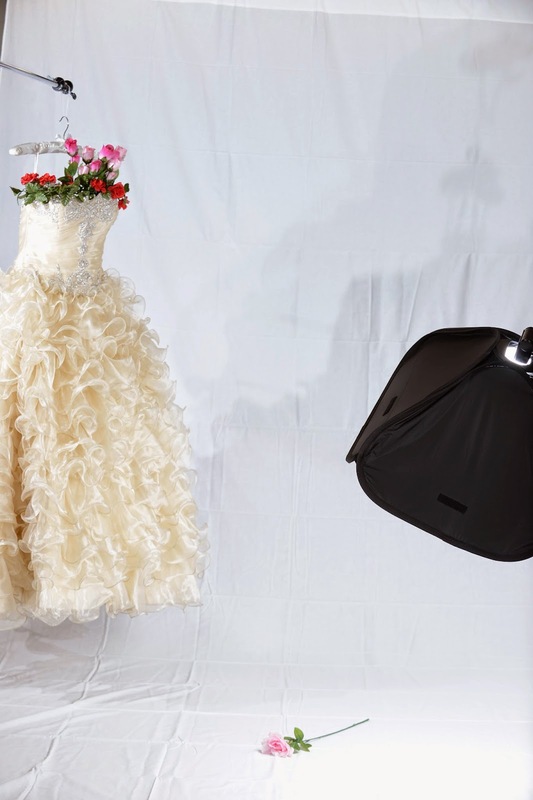 Remember that the camera is mounted on a tripod, and the focus locked manually on the dress. The Red Rose. Getting the rose in the shot was easy, but providing enough lighting to erase the wrinkles wasn't . In this shot, you can see that I could just swing the boom and moved the dress out of the way, and use a single softbox, held directly above the rose, to remove the fabric shadows on the floor covering (Photo #8). In theory, the two rose images were perfectly aligned. Here you can see the Lastolite EZ Box with a speedlight being used to add some optimistic top lighting. Again, here's the final shot after the two images were merged and treated to lots and lots of cloning. Once again, I have a dress floating in space, but not nearly so spooky with the hanger and the flowers. This was a lot of work for an image that could have been and easy shot if I raised the dress and the background and eliminated any hint of a floor beneath the dress. But If anyone asks about the juxtaposition of the rose beneath the dress, I can truthfully answer that it was really there, and can claim that it wasn't Photoshopped in place. This is also true if you ignore the extensive post production the image required. My take-away from the project was an appreciation of the difficulties of getting a crease-free, shadowless white background. It would have been easier if a roll of background paper was available, but weight and portability issues would have made the option impractical in the extreme. I probably need to explore a different way to store fabric backgrounds, or at least find some way to relax the wrinkles. I learned a lot, but it came at a high cost. I just hope Gretchen likes the shoot. Now on to the rest of the accessories.